We’re all way too depressed about the possibility of a positive and peaceful outcome in Venezuela. So I’m declaring today Learn-about-Georgia day. We’re talking post-Soviet Georgia, where a “rose revolution” peacefully overthrew a Soviet-era dictator last year. The overthrow of Shevardnaze was an inspiration, and the new government of Georgia is, to my mind, absolutely remarkable. Read up! I guarantee it’ll make you feel better. I heard this sensational documentary about it on the BBC yesterday and I felt like I needed to share. Because, man, if you think no one cares about Venezuela, spare a thought for Georgia – they’re as low in the international priorities list as you can go. But did they give up? No! They rolled up their sleeves, they decided to give themselves a government that does not tolerate corruption, and so they’re doing it, they’re overcoming their history, they’re overcoming their total absence of a democratic tradition, and they’re building their future themselves. If they can do it, surely we can do it too. I really urge you all to read up on President Saakashvili and, especially, to listen to the really remarkable BBC documentary about the new government. It’s 25 minutes long. You need a RealAudio player, but that’s free and so is the BBC content. 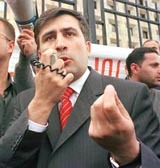 Open Democracy: Mikhail Saakashvili: new romantic or modern realist? Civil Georgia: Government-friendly online news.